Conflicting historical claims and lack of a recorded past from the tribes have made understanding the tradition and culture of this beautiful state of Arunachal a difficult task. However, the oral history being passed on to generations to this day by many Arunachali tribes point towards a northern origin in modern-day Tibet. But there is no material evidence to substantiate these claims. From the perspective of material culture, most Arunachali groups align with Burma-area hill tribals and hence, the local tribes have strong historical bonds with their counterparts in northern Burma (present day Myanmar). The most unusual Arunachali group by far is the Puroik(or Sulung) whose traditional staple food is called "tasey" or "taase" made from sago palm and their primary strategy is foraging. Considered as part of Tibeto-Burman stock, the Puroik culture and language are a tenuous reflection of an unknown origin tracing back to pre-Tibeto-Burman, Tai and Indo-Aryan roots. The Hindu texts Kalika Purana and Mahabharata mention the region as the Prabhu Mountains of the puranas. In one of these peaks, Sage Parashuram washed away sins, King Bishmaka founded his kingdom and Lord Krishna married Rukmini. Sage Vyasa was said to have meditated in one of the mountains here. Recorded history from an outside source is available in the Ahom (1228-1826 CE) and Sutiya chronicles. The Monpa and Sherdukpen clans have kept historical records of their local chiefdoms in the northwest region. Northwestern parts of this area came under the control of the Monpa kingdom of Monyul which thrived between 500 BCE and 600 CE. This region then came under the loose control of Tibet and Bhutan especially in the northern areas. While Sutiya kings ruled the remaining parts of the state, notably those bordering Myanmar until the Ahom-Sutiya battle in the 16th century. The Ahom kings ruled these areas except the northwestern parts of Arunachal until the annexation of British India in 1858. However, most Arunachali tribes remained largely autonomous till Indian independence and the formalisation of indigenous administration in 1947. Recent excavations of ruins of Hindu temples such as the 14th century Malinithan built during the Sutiya reign on the foot of the Siang hills in West Siang clearly indicate the influence of Indian subcontinent on Arunachali tribes. 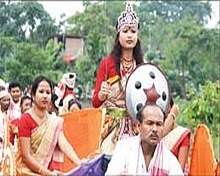 A heritage site Bhismaknagar has led to suggestions that the Idu (Mishmi) had an advanced culture and administration in pre-historical times. But there is no evidence to associate Bhismaknagar with any other known tribal place in Arunachal, but the Sutiya rulers held areas inhabited by the Idu groups from the 12-16th century. 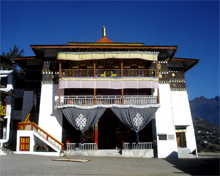 The third heritage site, the 400-year-old Tawang Monastery in the extreme north-west of the state, provides historical evidence of the Buddhist tribal people. The sixth Dalai Lama Tsangyang Gyatso was born in Tawang in 17th century and hence, this site is important for Tibetan Buddhists. As majority of the people in Tawang are Buddhists they owed their religious allegiance to the Dalai Lama in Lhasa, Tibet. 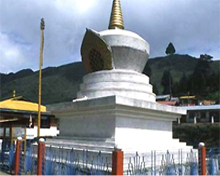 It is a fact that Indian control was established in the area north of the Sela Pass where the Tawang monastery and town are situated only in 1951. For till 1951, this area was administered by the Tawang monastery but the people were not regarded as Tibetan citizens. The People's Republic of China (PRC) became interested in Arunachal Pradesh only after it invaded and occupied Tibet in 1950. Before that it did not question the legality of the Indo-Tibetan border as delineated by the McMohan Line which came into existence after the Shimla Convention in 1914.